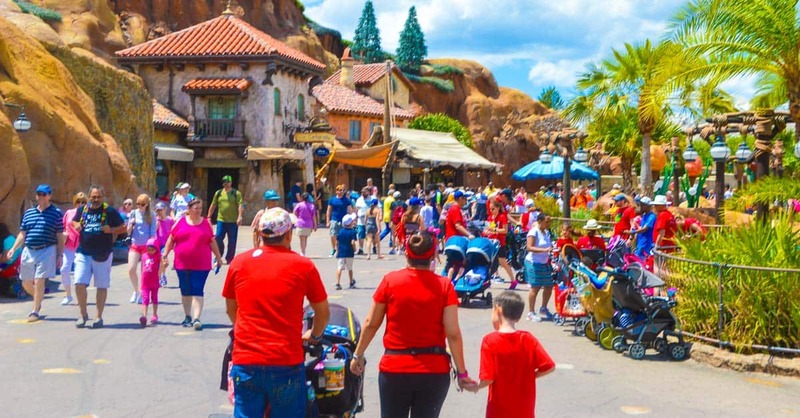 Trying to stay fit and healthy while on vacation—especially while in the Disney Parks—is one of those things that, to most people, seems absolutely impossible. How on earth are you supposed to squeeze your daily exercise routine into a day packed with rides, shows, and other exciting (but distracting) forms of entertainment? Worse yet, how can anyone stay on a healthy diet with so much junk food all around? Fortunately, there are ways to ensure your health doesn’t go down the toilet during your Disney World vacation. Here are 8 of our best tips for doing so. First of all, it’s important to keep in mind that simply walking through the Disney World parks gives you a significant amount of exercise. In fact, the average vacationer can walk as many as 10 miles per day. Why not get a pedometer and track those steps? If walking is a big part of your exercise routine, your step count should be more than covered, meaning you can remove that worry from your plate. All-Star Resorts — There is a paved path connecting the three resorts that is perfect for walking or jogging. Coronado Springs Resort — At this resort, the ¾-mile trail around Lago Dorado makes for a nice exercise path. Boardwalk Inn, Yacht Club Resort, and Beach Club Resort — These three neighboring hotels are surrounded by excellent paths. Not sure where to find one? Ask the front desk. They’ll be happy to help. Caribbean Beach Resort — The 0.6-mile path at this resort gives runners lovely views of Barefoot Beach. 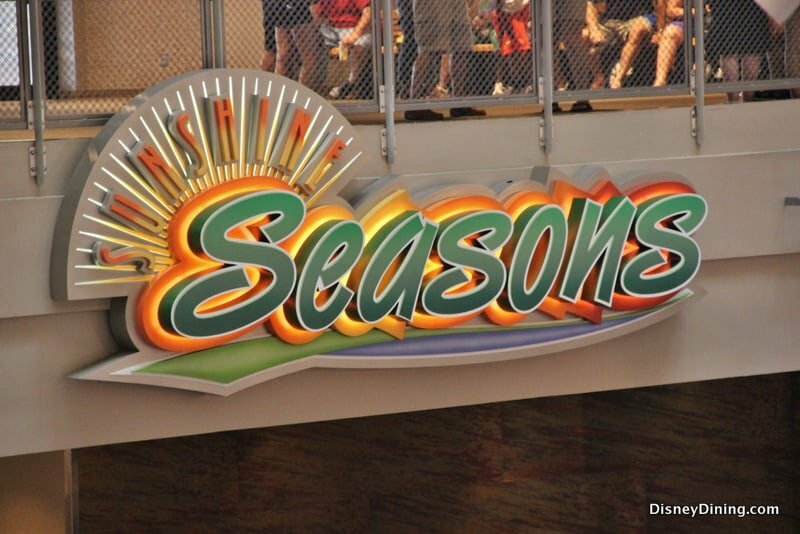 Swan and Dolphin Hotels — These sister hotels feature a nice trail that loops around Crescent Lake, as well as a few longer, more challenging options. Fort Wilderness and Wilderness Lodge — Here you’ll find a 2.5-mile trail that meanders through the resort grounds. There’s also a ¾-mile pathway that connects the two resorts. Grand Floridian and Polynesian Resorts — Between these two hotels, guests will find a paved pathway that connects the two and offers a lovely view of Magic Kingdom. Contemporary Resort — Make a loop around Bay Lake Tower on a nice, 0.9-mile path at this Magic Kingdom area resort. 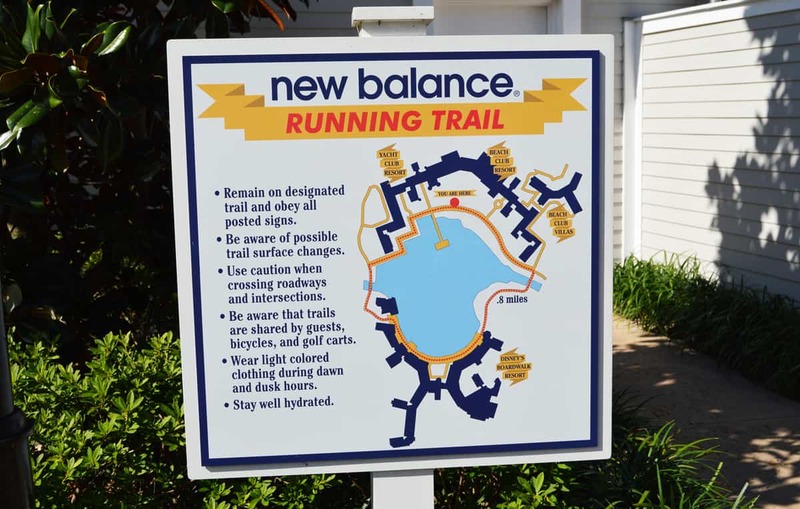 Port Orleans Resorts — A scenic walkway connects the two New Orleans-themed resorts and gives guests a lovely 1.7-mile workout. Saratoga Springs Resort — This beautiful resort has two designated jogging trails: one 0.8-mile option, and a second option that is 1.44 miles long. Old Key West Resort — A winding pathway that begins at Conch Falls, the 1.37-mile walking path at this resort runs alongside the golf course and is quite lovely. Pop Century Resort — This resort offers a paved path that winds through the grounds and along Hourglass Lake. Choose from the 1.1-mile or 1.38-mile loops. Art of Animation — This resort’s trail winds through fun, character-filled courtyards and along the scenic Hourglass Lake in a 1.38-mile loop. Of course, walking around Disney all day does increase your appetite, and snacking is bound to happen. For this reason, we highly recommend making a grocery store run the day you arrive or ordering groceries for delivery from Garden Grocer. By doing this, you can choose healthy snacks you know your family will enjoy, and since Disney allows outside food and drink, bringing those in won’t be a problem. All that said, if you don’t want to bring your own food in, there are healthy options throughout the parks. Watch for fresh fruit stands, delicious dill pickles, and yummy corn on the cob. All of these things can be found if you look hard enough, or you can always ask a Cast Member to point you in the right direction. 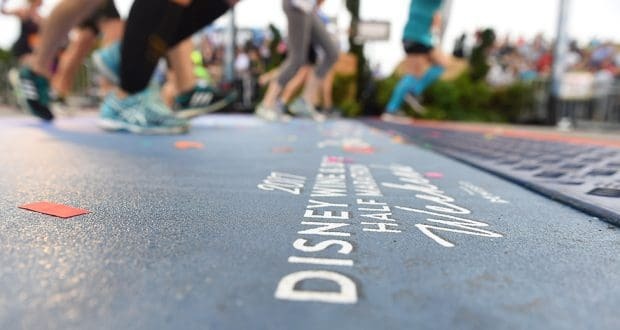 For those runners out there, RunDisney events are an awesome opportunity to combine running with the most magical place on earth. 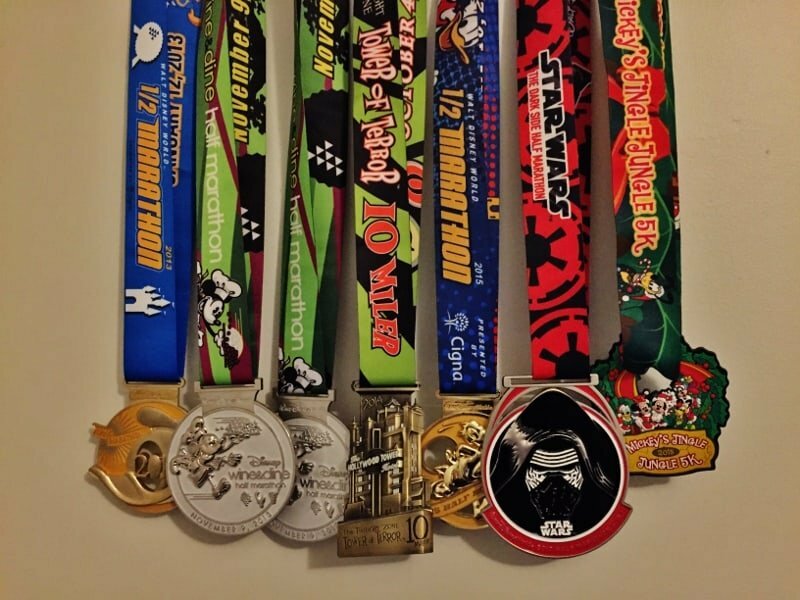 During these events participants race through the parks, each participant receiving a medal at the end. It’s tons of fun for beginners and seasoned pros alike, and we highly recommend trying one of these events out. The Swan and Dolphin hotels on Disney property actually offer full-fledged fitness classes to their guests. If you’re looking for some serious workouts during your visit, this can be a major perk of staying in one of these two hotels. 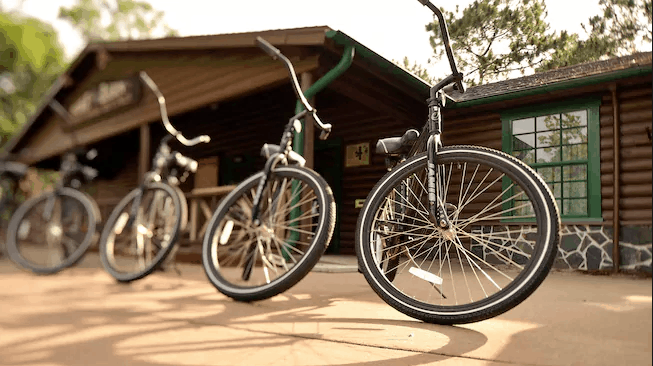 How do you keep fit while visiting Walt Disney World?